OTTAWA, Aug. 31, 2017 – The Indo-Pacific is increasingly the centre of gravity for global growth. But China’s rise – in combination with the United States’ withdrawal – is threatening the region’s stability. Brian Lee Crowley, Shuvaloy Majumdar and David McDonough, in a new paper for the Macdonald-Laurier Institute, make the case for a new Japan-India axis to counter China’s growing influence in the region. 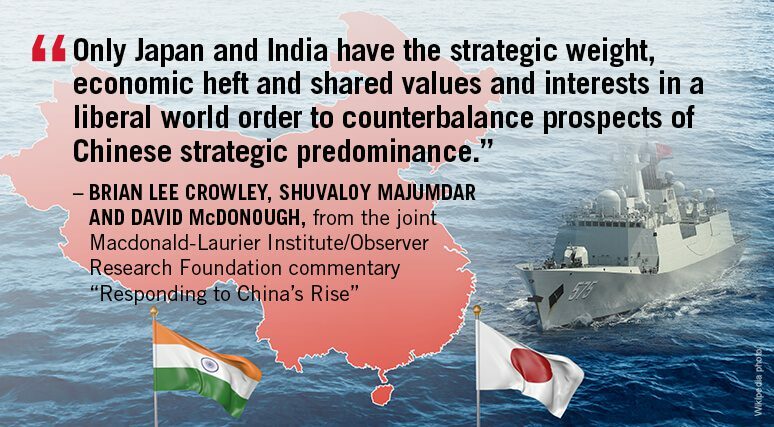 “Only Japan and India have the strategic weight, economic heft, and shared values and interests in a liberal world order to counterbalance prospects of Chinese strategic predominance,” write Crowley, Majumdar and McDonough. To read the full commentary, titled “Responding to China’s Rise: Japan and India as Champions for the Rule of Law in the Indo-Pacific”, click here. This commentary is a joint publication between the Macdonald-Laurier Institute and the Observer Research Foundation, which was voted as the top think tank in India in a prestigious set of international rankings. It’s based on a talk Crowley delivered at the Doha Forum in 2017, an important gathering of some of the world’s most pre-eminent politicians and thought leaders. India and Japan’s prospects for success would be even greater if such a powerful combination were buttressed by other like-minded democracies such as Australia, South Korea, key countries in the Association of Southeast Asian Nations (ASEAN), as well as Canada, given its interests in the region and close relationship with both India and Japan. An Indo-Japanese axis may also have the salutary effect of reawakening US leadership ambitions in the region. Its recent withdrawal from the Trans-Pacific Partnership, which would have helped balance China's economic might, demonstrates a declining willingness to be involved in the region. China is not a believer in the principles that drove parties of the TPP to the negotiation table –that the rules of international trade should be based on free markets, the rule of law and multilateral agreement. “Even when it participates in multilateral institutions, China does so largely to expand its own geo-strategic influence, or to counter the institutional order and influence of perceived rivals,” write the authors. Where its own interests are at stake, China has preferred unilateral measures and eschewed the peaceful resolution of disputes. In its maritime dispute with Japan over the disputed Senkaku-Diaoyu islands, for example, China has sent naval and coast guard ships to patrol these islands on multiple occasions, and deployed them to Japanese territorial waters as well. China even unilaterally declared an expansive “air defence identification zone” over the East China Sea, requiring all aircraft to notify and respond to Chinese authorities, or else risk a military response. Japan and India have the capacity to ensure a liberal institutional order, write the authors. Both countries also have distinct but complementary interests in countering Chinese power. Both countries’ geostrategic positions are complementary, with ongoing Sino-Indian territorial disputes helping to divert China’s attention and resources away from its maritime disputes with Japan, and vice versa. So too is their approach to Southeast Asia. Like India, Japan is wary of Chinese influence in the region. As a result, Tokyo has directed increasing investment flows to ASEAN countries, making it an ideal partner for New Delhi as it pursues a more expansive strategic engagement with the region under its ‘Act East’ policy. Washington might well be coaxed into supporting such a coalition the Japan-India axis leads, particularly given that its interests are closely aligned with those of Japan and India, especially in their view of China’s rise. Bring home to the new US administration the hard interests that underpin its engagement in the Indo-Pacific. Step in, if necessary, to fill – with like-minded Indo-Pacific nations – any leadership vacuum caused by American ambivalence. Shuvaloy Majumdar led democracy assistance initiatives in Iraq and Afghanistan from 2006 to 2010, and recently served as policy director to successive Canadian foreign ministers. He is a Munk Senior Fellow at the Macdonald-Laurier Institute. David McDonough is Deputy Editor at the Macdonald-Laurier Institute and a Research Fellow at Dalhousie University’s Centre for the Study of Security and Development.